Gain a clear, peaceful mind through meditation with these tips from Growing Your Inner Light: A Guide to Independent Spiritual Practice. We all have our preferred ways to balance our mental state, to soothe anxiety and to calm down. Some of these methods are more useful than others, some are easier to achieve than others, and some are safer than others. All can be done at different levels of consciousness, rendering the results more or less valuable, on a scale that varies from very effective to causing more problems in the long run. Meditation is a time-honored and effective method that is both direct and indirect. In meditating, you have a clear intention to calm the mind, empty the mind, and still the mind. At the same time, meditation has an indirect effect on your worries and concerns by changing your brain chemistry and altering your consciousness so that you naturally relax and gain a different perspective. In time, you become a less mentally cluttered, less anxious, more capable, and more peaceful person. 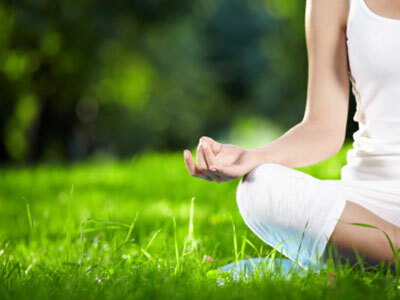 In a sense, we can say that any attempt to relax the body and calm the mind is a meditation. But the concept of meditation has a more purposeful and spiritual connotation than most of the other activities we engage in to clear the mind. The word meditation actually means to think about something deeply; the act of meditating, contemplation, reflection, and the contemplation of spiritual matters, especially as a religious practice. When I first began investigating meditation in my twenties, I had a hard time with it. I could find a sense of inner peace when I meditated in a large group, but by myself I was hopeless. I found the concept of meditation overwhelming, and I think that feeling really got in the way. I was an overly self-conscious meditator. I thought it sounded rather grand and special to say, “I’m going to meditate now,” and in the milieu I lived in then, it was indeed unusual. I wasn’t close to anyone who meditated regularly, so I didn’t have a sense of it as an ordinary, daily thing to do. I thought that only very focused, organized, really spiritual people would meditate regularly, and that wasn’t me. I had spiritual ambitions, but I had a hard time relating to being that focused. It was enough for me to organize my domestic life and my work. Organizing a meditation practice on top of that seemed like overkill. But I was definitely intrigued, and I felt enough of a hole in my center and a nagging sense of disconnection from both myself and from something unnameable that I knew I needed to take action. I began to force myself out of bed at 7 AM to sit in front of my altar and stare at a candle, trying not to think. I would try really hard to have an empty, peaceful mind. Predictably, this didn’t work, and I would feel as edgy and annoyed at the end of the requisite half hour as I had at the beginning, when I had pried myself out of a warm bed. I kept up this mental and physical torture for many months before I gave up, convinced that meditation was not for me and wondering what all the fuss was about. But I noted the disparity of my private experience with the good experiences I had at a Buddhist center, in a group of other. There I had entirely new experiences, such as finding myself in a waking dream, staring out over a vast lake that filled me with a deep sense of peace. I had no way of explaining this other than that it appeared to be connected to the mind-pool of the meditators. Time went on, and I continued to study Buddhism when I could. I gradually began to gain a sense of self-confidence and felt less daunted by the concept of meditation and contemplative spiritual practice. At the same time, I embarked on a period of shamanic study that entailed periods of isolation and various initiations that had a cumulative effect upon my awareness. Most of this study was spent in nature and was very healing. I didn’t go back to forcing myself to meditate. At that stage, it clearly wasn’t a workable tactic. But what I found over time was that if I just sat still, not doing anything, especially if I could sit outside in a peaceful, natural environment, meditation would naturally occur. That is, my mind would empty of nonessentials, and I would find myself contemplating whatever really mattered to me at the time and finding answers. So clarity of mind began. Every day, or as often as possible, go alone to a place of natural beauty — your backyard or garden, a hillside, or the beach, if you are lucky enough to live near one. If the sun is shining or the moon is out, and if you can find a place near water of some kind, all the better. Sit on the ground or on a rock and get as comfortable as you can. There is no need to strain your body in any way when meditating. Sit with your back straight and your legs crossed, if you can. Place your hands softly on your knees. Keep your eyes gently open. With gentle eyes, notice what you see. Feel the breath of the wind on your face. Settle into your sitting place. Let your breath sink down into your belly. Breathe deeply. Let your breath expand your heart and throat. Breathe deeply. Let your breath go down to the base of your spine. Breathe deeply. Let your breath go up to the crown of your head. Breathe deeply. Let your breath go down into the earth beneath you. Breathe deeply. Let your breath go up into the sky above you. Breathe deeply. Feel the gentle expansion of your energy field upward, downward, and outward, connecting with all things. Now bring your attention gently back to the belly. Breathe steadily, normally, and happily into your belly. Sit in quiet contemplation of the beauty of life. Let go into this air, this earth, this sun, and this water. Sit for as long as you like. When you feel ready, get up and stretch. Breathe deeply. Move on with your day, taking the slow and centered rhythm from your meditation with you. 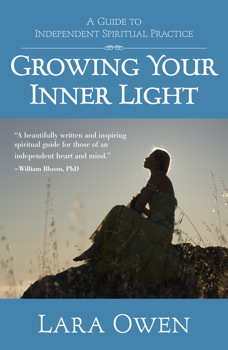 Growing Your Inner Light gives readers the freedom to integrate from different traditions -- and develop new ones -- in order to create their own spiritual tradition. One former student of Lara's program shared that she feels "less like a spiritual tourist and more like a pilgrim." Spiritual development is a natural part of being human, and a vital way to expand the intensity of your inner light throughout your life. Lara Owen, author of Growing You Inner Light: A Guide to Independent Spiritual Practice (Copyright © 2009 by Lara Owen), has trained with spiritual teachers all over the world and has made a lifelong study of spiritual practice in several traditions. She has a background in Chinese medicine and psychotherapy, and has worked in publishing, television, and documentary film. Lara lectures internationally and maintains a consulting practice working with individuals, groups, and organizations. She is the author of several books on personal and spiritual development, including Love Begins at 40 and the acclaimed Her Blood Is Gold.